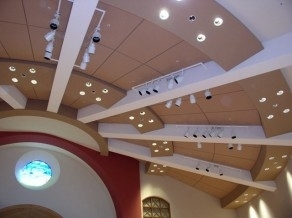 Since 1979 George Family Enterprises has served the San Francisco Bay Area providing quality Acoustical and Decorative Wall and Ceiling Systems. We have had the opportunity over the past 30 years to perform work at some of the more prestigious places including SF MOMA; the deYoung Museum; The Resort at Fort Baker; Skywalker Ranch; the Olympic Club; San Francisco City Hall, UC Berkeley and USF projects; San Francisco and Oakland Airports; AT&T Park; Oakland Arena; Red Hawk Casino; Letterman Digital Arts Center. Our retail installations have taken us to nearly every state in the US and we have successfully completed over 40 installations in Canada, the UK, Italy, China, Japan, Switzerland, Germany, France, Scotland, Ireland and Australia.